Another one of our favorites! 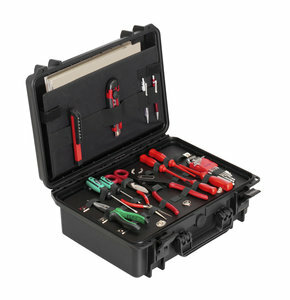 The case is build with a bottom foam of 10 mm which protects your tools. In the bottom there is 1 tool pannel with elastics to hold your tools. You can fix this pannel. In the lid there is the document pouch. It fits a lot of tools! We also love the combo to use a pick and pluck foam in the bottom underneath the bottom toolpannel. Sold seperatly with accessories.